This blog is one of a six-part series celebrating World Food Day and highlighting the particular food and nutrition security challenges faced by African nations through six case studies in the Brookings Global Ending Rural Hunger project. The findings summarized below can be found in more depth in the Ending Rural Hunger Senegal case study. The other case study countries include Nigeria, Ghana, Tanzania, Uganda, and Ethiopia. In June 2014, at the 23rd Ordinary Session of the Summit of the African Union, African countries signed the Malabo Declaration, pledging to eliminate hunger in Africa by 2025. Efforts to achieve this objective focus on reducing child malnutrition, specifically decreasing stunting of under-5 children to 10 percent and underweight children to 5 percent within the decade. Similarly, Sustainable Development Goal 2 (SDG2) is dedicated to the elimination of hunger in all its forms by 2030. Senegal aligns with both of these agendas as noted in its Emerging Senegal Plan (PSE), which sets food security as one of its top priorities. Its national efforts are further delineated in the National Strategy for Food Security and Resilience (SNSAR). Using data from the Ending Rural Hunger (ERH) project, the ERH Senegal case study identifies the priority food and nutrition security (FNS) needs of Senegal, analyzes its policies created to fight hunger, examines the resources that support these policies, and finally recommends ways to improve the overall country strategy towards hunger eradication in Senegal. 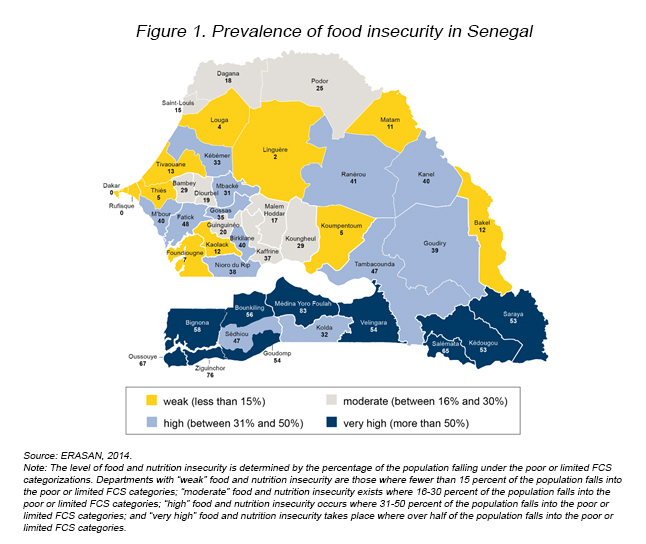 The analysis shows that Senegal’s food and nutrition insecurity is highly correlated to the quality of food consumption, although food accessibility is also an obstacle. Low dietary diversification, and consequently the high prevalence of child malnutrition, remains a major challenge for the country. Senegal falls among the 10 developing countries with the highest prevalence of anemia in children globally at 79 percent. The rate of under-5 wasting in Senegal is also high at 9.1 percent, exceeding the African average of 7.8 percent (ERH, 2016). Vulnerability to food security in Senegal varies according to place of residence (urban vs rural), sociodemographic and economic characteristics, and geographic region. Indeed, food and nutrition insecurity is more prevalent among rural populations, smaller rural households (fewer than 10 people), and households headed by women or youth under the age of 40. For instance, 18 percent of children living in rural areas are underweight, while 10 percent in urban areas are. A higher share of children in poor households are underweight (21 percent of children in the poorest quintile compared to 18 percent of children of the wealthiest quintile), and a higher proportion of boys (17 percent) than girls (14 percent) are underweight (DHS, 2015). Food insecurity is also more prevalent in the southern and eastern regions, despite their natural resource endowments and economic potential. The analysis of food consumption scores by region shows that the southern and eastern departments of Ziguinchor (67.0 percent), Kédougou (56.9 percent), and Kolda (56.3 percent), and Sédhiou (52.3 percent) have relatively high proportions of households whose food consumption is considered poor and limited, compared to the northwest and central regions of Dakar (0 percent), Louga (17.4 percent), and Tambacounda (18.9 percent). Lack of roads and poor quality of transport infrastructure are constraining factors for market access, hurting food security. Instability in the south has also hampered agricultural production in the region. Production and food supply are erratic in Senegal due to dependency on rain-fed agriculture, unfavorable climatic conditions, and low water availability. Less than 4 percent of arable land is equipped for irrigation, and Senegal has the highest volatility of food production in sub-Saharan Africa. Senegal also falls far below the sub-Saharan African average for both cereal yields and agricultural value added per worker (ERH, 2016). The average cereal yield in developing countries (2432 kg/ha) is double that of Senegal’s (1157 kg/ha). Similarly, in terms of agricultural value added per worker, Senegal is 10th within West Africa and 22nd in sub-Saharan Africa. To supplement the inadequate domestic production, particularly for cereals and animal products, significant amounts of food are imported to cover the country’s production deficit. Over the period 2009-2011, the dependency ratio on cereal imports was 46.9 percent, indicating that almost half of the cereal requirement is imported. At the same time, the multidimensional poverty rate is very high for Senegal at 78.6 percent, surpassing the sub-Saharan African average of 73.4 percent. Given that rural households typically spend more than half of their budget on food, they are particularly vulnerable to food production shocks and resulting price shocks. Furthermore, indicators from the ERH database related to environmental shocks show a projected decline in crop yields of 31 percent in Senegal due to climate change, and that 22 percent of land has low soil organic content and high soil erosion. These projections suggest that climate change and land degradation pose a substantial risk to the country in the years ahead. What policies are in place? Public authorities have made significant efforts to define strategies to combat food insecurity and malnutrition, as well as provide financing and infrastructure for agricultural policy implementation. Senegal’s government agricultural spending is $60.60 per capita, the fourth-highest in sub-Saharan Africa, which has an average agricultural spending of $22.90 per capita. Despite this accomplishment, progress made in achieving FNS is insufficient, as noted above. High expenditures, combined with food insecurity, suggest inefficiencies and weak control of agricultural expenditures. So far, productivity gains fail to match the government’s ambitious targets, in part due to institutional inefficiencies embedded in these agricultural support programs. In addition, some studies suggest that agricultural subsidies do not consistently reach their targeted beneficiaries, and the government may overemphasize spending on input supply services, which have short-term effects on production, but not on long-term growth in the sector (IPAR, 2015; Seck, 2016; Cabral, unpublished manuscript). Nevertheless, there have been some noteworthy performances recently in Senegal’s FNS programming. Ongoing and recently established initiatives, including interventions related to rice self-sufficiency, child malnutrition (Nutrition Enhancement Program), and conditional cash transfers and emergency contingency planning (Programme national des bourses de sécurité familiale) show promise in addressing the country’s priority FNS needs. Moving forward, the government must redesign its FNS policies and better target its beneficiaries (i.e., the most vulnerable populations) to increase the efficiency of its operations. Two policy areas where the government should focus its attention are: (i) increasing agricultural productivity through reallocation of resources towards more targeted investments in infrastructure, research, and human capital for more sustainable gains, and (ii) reducing the high volatility of food production in Senegal and the country’s vulnerability to environmental shocks. The analysis of the state of food and nutrition security in Senegal also shows the need to focus on improving food quality as one of the top priority areas for Senegal. Strengthening the quality of food consumption necessitates targeted interventions to promote dietary diversification and increased consumption of foods high in calories and protein. Given the nutritional gaps in Senegal relative to other African and developing countries, efforts should focus especially on supporting the fight against anemia and reducing the high prevalence of underweight children. Cabral, F. J. “Bias against public capital, economic growth and poverty: the case of the agricultural sector in Senegal.” Unpublished manuscript. Ending Rural Hunger (ERH). 2016. Ending Rural Hunger Database. Washington, DC: Brookings Institution. https://endingruralhunger.org/. SE/CNSA, DAPSA, and ANACIM. 2014. “Enquête rurale sur l’Agriculture, la Sécurité alimentaire et la Nutrition 2014 (ERASAN, 2014),” Rapport provisoire de l’enquête ménage. Dakar, Senegal: SE/CNSA. DHS (Demographic Health Survey). 2015. Enquête Démographique et de Santé Continue (EDS-Continue, 2015). Rockville, Maryland, USA: ANSD/Senegal and ICF. IPAR. 2015. “Subventions des intrants agricoles au Sénégal : controverses et réalités.” Rapport sur l’état de l’agriculture et du monde rural au Sénégal. Dakar, Senegal: IPAR. https://www.ipar.sn/IMG/pdf/ipar-rapport_agriculture-2015-_p_p_.pdf. Seck, A. 2016. “Fertilizer subsidy and agricultural productivity in Senegal.” AGRODEP working paper 0024, April. Dakar, Senegal: AGRODEP.